From one carnival atmosphere to another. 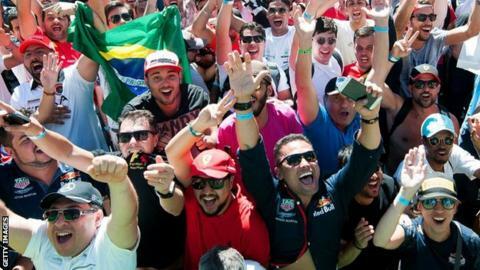 After Lewis Hamilton wrapped up the world championship in the vibrant buzz of Mexico City, it's now Brazil's turn to host the F1 after-party worthy of a five-time title winner. Autodromo Jose Carlos Pace, located in the Sao Paulo suburb of Interlagos, is more than familiar with sensational highs and emotional celebrations. It's all been witnessed by an enthusiastic fanbase crammed up against the circuit walls, cheering so wildly and intensely, many feel this race should take back the honour of being the season finale. The city of Sao Paulo is home to 12 million Paulistanos (as the locals are known) and as such, is a frenetic assault on the senses. An estimated 40,000 skyscrapers make up this sprawling metropolis, along with colourful street art, a melting pot of cultures and traffic so hellish, you'll wonder why on Earth anyone would ever own a car in the first place? Interlagos itself is not the prettiest of pictures. Crime has been an unfortunate part of the Brazilian Grand Prix and in 2017, personnel from Mercedes team were robbed at gunpoint. With Brazil's notorious favelas surrounding the venue, this is not the place to go for a midnight 'tourist walk' off the beaten track. One of the biggest aspects that makes the race so exciting is the uncertainty of the weather. A whopping big thunderstorm is never far away and when conditions get soggy, the fans and atmosphere go into overdrive. There may be nothing to play for in terms of a title scrap but if the heavens do open, then the accolade of 'wet-weather master' will be a hotly contested between Hamilton and Red Bull's Max Verstappen, arguably two of the best drivers when rain comes into play. The Dutchman especially gave the drive of a lifetime in treacherous conditions at the circuit two years ago, surviving spins, overtaking both Ferraris and gaining 10 places in the closing laps to finish third on the podium. Title-winning elation, biblical downpours and home-grown drivers in tears. The Brazilian Grand Prix has seen it all during its stay on the F1 calendar. For this week's quiz, we've chosen eight memorable moments from the Interlagos circuit. All you have to do is guess the correct answer to each of the clues given. Three minutes on the timer. Go! Go! Go! Welcome to the club: To get to a fifth, Lewis Hamilton only needed a fourth... place finish, that is. Max Verstappen celebrated the race win in Mexico City but the day belonged to the now five-time world champion. "To complete this, when [Juan Manuel] Fangio has done it with Mercedes, it is an incredible moment"
The statue of Christ the Redeemer in Rio de Janeiro weighs 635 tonnes, is 38 metres high including its pedestal and was named one of the "New Seven Wonders of the World" in 2007. Jardim Gramacho (Gramacho Gardens) once one of the world's largest open-air landfills, received close to 8,000 tons of rubbish daily, 70% of all the trash in the Rio metro area. The dump was closed in 2012 after 34 years in operation. During the 1932 Olympics in Los Angeles, Brazil's delegation of 82 athletes had to travel by ship and sell coffee along the way to fund the trip. Once at the Games, only athletes who had a chance of winning a medal were allowed on shore because of the $1 disembarkation fee. There is an island off the coast of Brazil, 93 miles away from downtown Sao Paulo, that is so infested with a unique species of pit viper called 'the golden lancehead', that the Brazilian navy quarantined the site and nicknamed it "Snake Island". Pierre Gasly enjoyed a 'petit' weekend away in Brittany: "And yes, it's nice in Bretagne even in November"
Is there any space left for all five titles to be inked on Lewis Hamilton's back? Meanwhile... a tattoo-free Valtteri Bottas is busy packing his own suitcase: "Race week #BrazilianGP"
BBC Sport has live coverage of all the season's races on BBC Radio 5 live and BBC Radio 5 live sports extra, plus live online commentary on the BBC Sport website and mobile app - including audience interaction, expert analysis, debate, voting, features, interviews and video content. All times GMT. Broadcast times are subject to change at short notice.